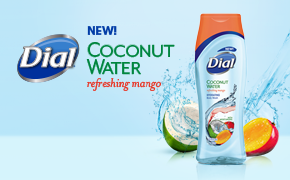 Recently I received a bottle of Dial’s new Coconut Water with Refreshing Mango Body Wash to try out. It. smells. awesome. What a fun scent for the shower with “hints of green coconut and tropical mango.” This body wash is designed to make your skin feel clean, healthy and hydrated. We love this new scent. It’s refreshing yet light enough to prevent you for smelling like perfume afterwards. Would you like to try it for FREE? Leave a comment below telling me whether or not you have tried this new Dial Body Wash scent and I will be randomly selecting one person to win a coupon for a FREE BOTTLE. Winner will be selected on 8/23 and notified via email. Good luck! ← ShopRite $5 and $10 Coupons in Today’s Paper! We haven’t tried it yet, but it seems like the perfect scent for our family! Thanks! I have not, would like to try this scent! Thanks for the opportunity! I have not tried it but would like a chance to. I have not tried it but I would love to. I haven’t tried it but it looks awesome! Love the smell of coconut – makes me feel like I’m on vacation with an umbrella drink. Would love to try this! I haven’t tried it but would love to! I’ve tried the soap and loved it!! I would like to try the bodywash. I have not tried it sounds like it smells good. No I haven’t tried it but I would like to.